The beautiful double heart-drop bead charm is carefully inscribed with the Welsh word "Cariad" meaning 'love', 'darling' or 'beloved'. Two 9ct rose gold love hearts hang from the sterling silver charm, each containing rare Welsh gold from Snowdonia, representing two people that are deeply in love. Good solid charm with delicate hearts detail to add to my bracelet. My Wife likes Clogau products and is currently building a collection of charms on her bead bracelet. It was a Sunday evening and I was stuck in Cyprus. 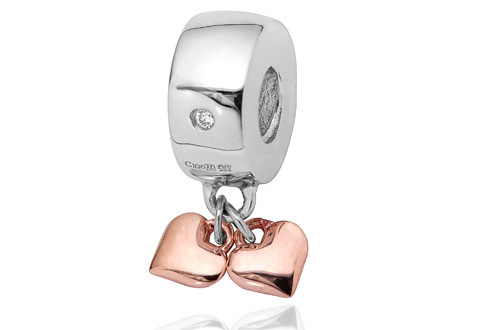 I logged onto the Clogau website and ordered the 'Cariad Heart Bead Charm' as I knew that it would be appreciated. When I phoned home that evening, I told her that a small package would be arriving addressed to me, but that it was for her. I just said that she desrved a little surprise. The charm arrived on Tuesday morning. That's what I call service. I love this bead charm, it looks great on the bracelet. Delighted with the item, looks great on the bracelet. My recent order received the usual efficiency that I have experienced in the past. Despatched within days and well packaged to protect the purchases. The beads continue to enthral my wife as her bracelet is added to. Congratulations on maintaing both quality and service. Ive wanted this charm for some time and decided to treat myself as my husband wasnt listening to my hints. Its just beautiful and the little diamond on it is a lovely extra. The quality of clogau is second to none and Im loving filling my bracelet up. Each charm I have signifies someone or something in my life. Please can you develop a charm to signify family. Another beautiful charm with exquisite workmanship which fits perfectly on my wifes Milestone bracelet. This is a beautiful charm & its got some weight to it...the tiny diamond was a nice surprise as its not mentioned in the description...I thought at first that it could have been a crystal so I e-mailed customer services to confirm... I got a very prompt reply. I will be ordering more items to add to my growing collection of Clogau Jewellery. I already have the Sessile oak ring (rose & yellow gold) a gorgeous silver & gold daffodill locket with daisy links on the chain & gold daffodil charm!!! Everything has been much nicer than it looks on screen... the photos dont always do the items justice!!! There are others on the market, but this is far superior! This charm has a nice weight to it but wish there had been a little more gold on it, but very pretty. I did purchase the strawberry which is nearly all rose gold. I think it is my favourite upto date, that too has a nice weight to it and it looks good. Well I love all the charms so far, come on Clogau!!! Get some more for us to choose from, people have commented on my bracelet, there are others on the market! BUT this is far superior! very pleased with this charm, presentation was also beautifully done, would highly recommend. Began collecting only a month ago the charms I need to assemble my dream bracelet. So far only have eight charms. This bracelet is the one Ive been waiting for all my life. I only wish I could have discovered Clogau sooner. The bracelet is stunning to look at and very tactile, my friends have the usual charm bracelets - the more common names - but mine stands out a mile above the rest - they are so envious! They should have waited as quality takes time to unfold. Thank you Clogau. Fantastic piece. Looks great on the bracelet, much more substantial than the picture gives it credit. Love it, love it, love it!